Scientists believe that touch is the first sensation to develop in the uterus. It is also a very intimate sensory experience of interpersonal communication. Humans also give meaning to gestures, with the most intimate and frequent gestures enacted on the touchscreens of our phones. What happens if these habitual gestures are used between people? 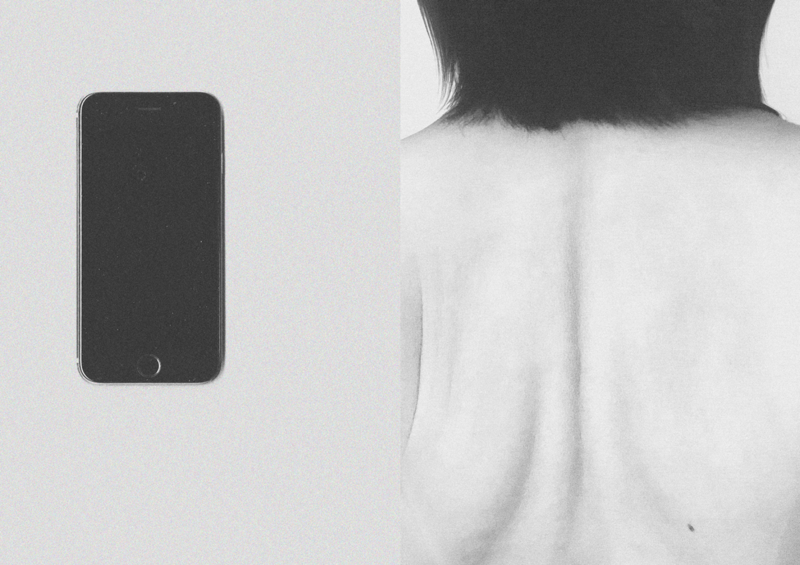 Intimate Touch aims to create a situation in which skin is a social space, gesture is an interactive mode and sound is a feedback mechanism. This project puts sensory experience, social contact and emotion on the same latitude with the intention of improving tangible and face-to-face interaction and happiness. It also allows people to think about and weigh the meaning of both forms of communication. In this mobile age, people cannot live without mobile phone, it is like an external organ of human being. The most intimate and frequent touches are given to the mobile phones rather than to families and friends. With the deepening of mobile life, the behavior of mobile phone operation even turns into an involuntary action, checking and playing with the mobile phone from time to time, even if there is no message need to be replied, or we are not looking for any useful information. Like written language, gesture has been endowed different meanings in different areas. Sign language is one the earliest language human use in history, and it is still widely used as a means of communication. In the context of changing interpersonal communication patterns, by relating the effects of habitual and addictive behaviors, starting with cell-phone digital gestures, is it possible to use the affordances of these habitual digital gestures to create new behaviors that promote tangible contact? Observation is a useful and interesting investigation process, and it can be found that there are many things that I didn't care much about before. It's also a starting point for collecting and analyzing touchscreen gestures. The corporal change of hand contact with the mobile phone form a wide variety of gestures, different way of holding the phone, the use of different methods. These touchscreen hand gestures are different from other gestures and sign language, they are universal, different races, countries, cultures, and genders all carry the same affordances of gestures to communicate with cell-phones. Our touch on cell-phones has become the most intimate form, like a close touch and hug, and cell-phone seems to be our close lover. 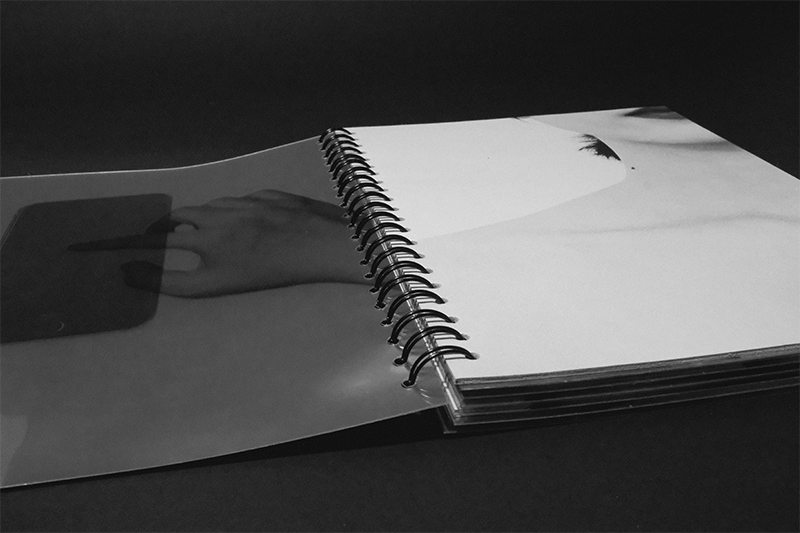 I began to try to represent the contrast between two kinds of touch by means of printing. Every time you touch your phone, it's like a hug to your lover. 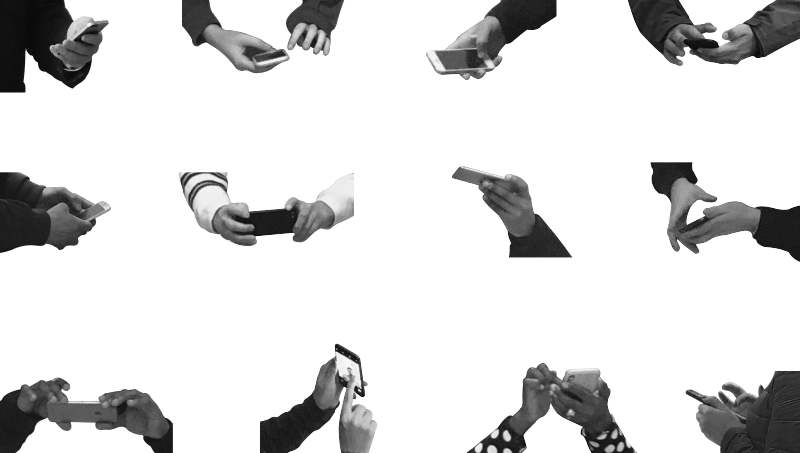 This tangible contact between hand gestures and cell-phones creates an invisible touch language. There are two ways to read this book. 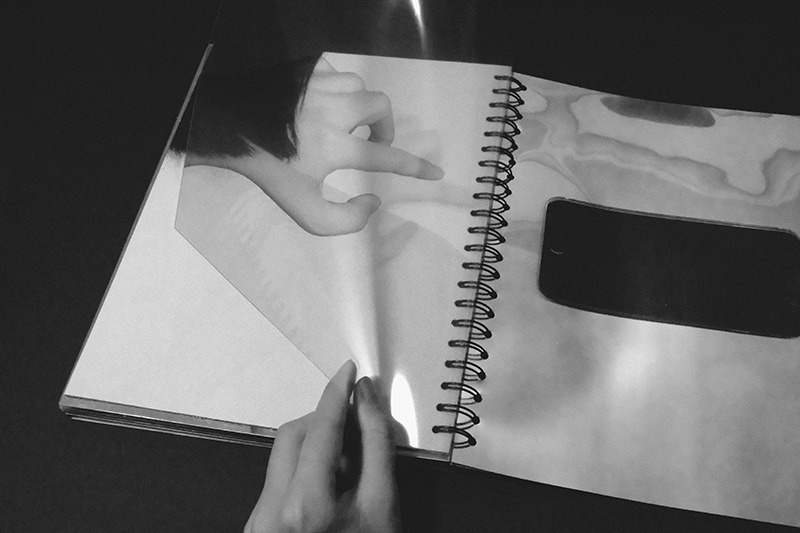 Flipping through the front is the interaction between the gesture and the human body, flipping through the reverse is the interaction between the gesture and the cell-phone to contrast two different kinds of intimate touch. Contrast the two touch forms and map the two communication modes. Contrast the skin and the phone screen from the essence of the material. The image of the skin is printed in leather, reflecting the soft feel of the skin and the texture of pores. 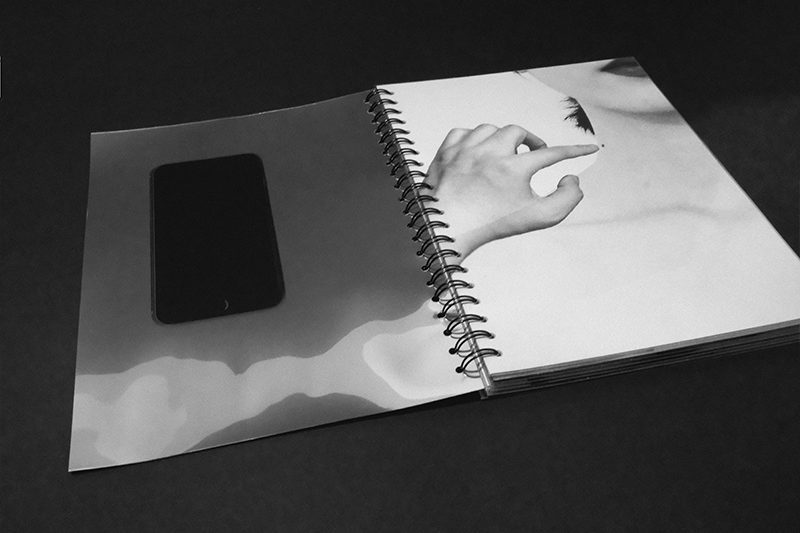 The part of phone printed with a metal-like material, showing a cold touch and visual form. What would happen if the habitual gestures, which applied to the operation and touch of the cell-phone were applied to human skin touch? This interview aims to find out what do other people think of this kind of intimate touch, which use digital gestures of cell-phone. On the one hand, I want to see their expressions and reactions when I touch them. On the other hand, I want their feedbacks. So it is divided two parts. I started to try to create the interactive environments-through the influence of association of habitual and addictive behaviors, find out the feasibility of transforming body or skin into an interface with gesture interaction. This prototype is designed to test whether the skin acts as a conductor and can trigger sound feedback through a combination of Conductive Adhesive and Bare Conductive Board. Input a sound to each port of the board to achieve the result. Although this prototype achieves a stable wearable and touching skin to get sound feedback, but it hasn't been synchronized with gestures - It didn't achieve the results of using different touchscreen gestures to touch the skin gets different feedbacks.Further trials are needed. The aim of this interaction work is to bring people together to create an unpredictable positive relationship between the audiences. In a game-like interactive space, skin contact and interaction are seen as a necessary process to achieve a certain purpose. Touchscreen gestures as a medium for people to think, since we love to touch our phones with these gestures, let's touch the people around us more in this way. It can be achieved by coding with two major devices. One is a device for measuring contact, which is a measure system, and one is a device for capturing gestures, called Leap Motion. The measure device has two ends, and when each of us touches one end, and then we touch each other's skin, and we get different values here. So I can get the number of different touches that I need to record. Leap Motion is a technique for capturing gestures, when the two technologies are combined with coding, it can achieve the result that two people interact through touch.